Luxury Problems is Andy Stott’s third in a series of related double packs that began with Passed Me By in 2011. While the past two years have seen him fold gnarled voices and codeine-laced disco samples into his sludgy brand of “knackered house,” the addition of honest-to-goodness singing shifts the focus of his music in a much more melodic direction. The release opens with the expertly looped and layered vocals of “Numb” with distant synthesized sounds exacerbating the harmonic qualities therein. But lest you think Stott’s music has become more accessible, right where you expect a kick drum to barge in we instead get a churning, door-knocking sound — one that lacks the thud we’d usually expect from club music and whose alien sound is both intriguing and disquieting. Luxury Problems is not “Andy Stott gets embraced by indie kids” — that’s surely already happened — but is instead the work of a producer seeking to discover what forms his now-signature sound can mutate into. “Lost and Found” follows and is much more recognizable as Stott’s work, as this time operatic voices are laid over a fairly straight, menacing groove instead of sitting front and center in the arrangement. But in splitting the difference between Stott’s modus operandi and the stranger forms of “Numb,” it’s a bit unconvincing. Much better is “Hatch The Plan” — a languid roller whose vocals are perched delicately above a soot-covered bass line. Those who sit in dark rooms and listen to We Stay Together loudly on repeat will certainly find much to love in “Sleepless,” an exceptional slice of grooving techno that ranks among Stott’s very finest and eschews singer Alison Skidmore’s vocals entirely, as does the sinister “Expecting.” But it’s “Luxury Problems,” with its ethereal vocal work, straight-laced house beat, and propulsive bass line, that’s the album’s best, and a prime example of Stott’s ability to seamlessly fold a distinctive singer into his more traditional, techno-oriented club tracks. The excellent amen chopping of “Up The Box” is an invigorating curve ball, and closer “Leaving” returns to the vocal led harmonies that “Numb” began with. It’s almost a complete break with everything Stott has done in the past, devoid of most percussion and sweetly melodic, seeing the album out on a peculiar, somber note. Luxury Problems is a bit of a complicated listen, then: assuredly different (in most places) from Stott’s much loved previous work, and forging ahead into interesting new terrain with varied results. Taken together it all makes a strange sort of sense, as the vibe throughout Luxury Problems is consistently pensive and subdued thanks to Stott’s deft vocal dissecting and nearly narcotic production. Even the jungle of “Up The Box” sounds like it’s taken one too many painkillers to muster up much energy. Stott’s sound is confident, yet perhaps still in a state of flux. Compared to the single-minded clarity of his 2011 efforts, Luxury Problems is more a transitional step to the side than a swan dive deeper into his knackered house’s murky depths. Where it shines, it’s exceptional. For many, encountering an artist in this kind of liminal state leads to engaging, thrilling results, even if takes some time to unwrap the numerous sounds and styles within. I’ve just streamed this over PBSR: This music is absolutely incredible, mind blowing. Not sure of the source, couldn’t find any information. If anyone else has an idea I’d be happy to credit the photographer. perfect choice!! did you just find it online or is it a scan? it’s so beautiful, i want to cry! Just found it online during our usual searches. Andy never ceases to impress me. He’s done it AGAIN. The picture of a building is from another review, it doesn’t match the Stott article. Both reviews that run each day have the same image. 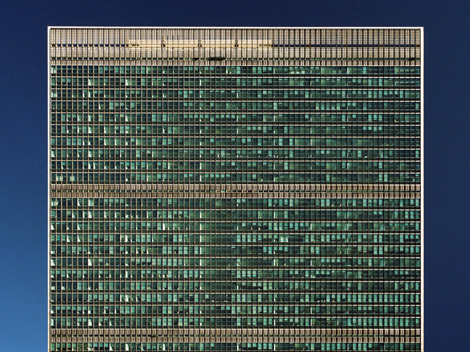 that’s the united nations building in new york city!